Family & friends are invited to attend Visiting Hours on Tuesday March 26th from 4:00 p.m. to 8:00 p.m. in the Vertuccio & Smith, Home for Funerals, 773 Broadway (Rte. 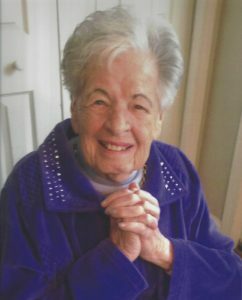 107) REVERE, for Mary M. (McCormick) McCauley, who passed following a brief illness on Sunday, March 24th, at the Winchester Rehabilitation & Nursing Center of Winchester. Her funeral will be conducted from the funeral home on Wednesday, March 27th at 9:30 a.m., followed by a Funeral Mass in the Immaculate Conception Church (Corner of Beach St. & Winthrop Ave.) REVERE at 10:30 a.m. and immediately followed by interment in Woodlawn Cemetery, Everett. Born & raised & educated in East Boston, she was an alumna of East Boston High School, Class of 1941. Mary worked her early years as a waitress at several of the venues at Logan Airport & at the former Reardon’s Restaurant of Revere. She, lastly, was employed at Cerretani’s Market Inc. in Revere as a clerk, a job she enjoyed. Mary had a large & outgoing personality, always, a smile and always a laugh. Foremost in her world was her late beloved husband, Peter E. McCauley, Sr., who passed in August of 2009. She is the devoted mother of Virginia A. Cerretani of Revere, Peter E. McCauley Jr. & his wife, Marion “Meg” of Orlando, Florida, Donna M. Testa & her husband, Lawrence of Reading. She is the cherished grandmother to Alexandra C. & Ashley M. Testa, both of Reading, GianPaolo Cerretani of Revere & Kelli Y. McCauley of Orlando, Florida. She was the dear sister of the late Loretta M. Gianino-Conroy, Anne V. Nagle, Harold “Happy” McCormick, Leonard McCormick, Vincent “Lefty” McCormick & Leo McCormick. She is also lovingly survived by her faithful friends, Suzanne Dubuque of Reading & Nora Moscia of Lynnfield. Tuesday, March 26th from 4:00 p.m. to 8:00 p.m.
Remembrances may be made to the Patient Activities Fund at Winchester Rehabilitation & Nursing Center, 223 Swanton St., Winchester, MA 01890. I am very sorry for your loss of your Mom. She was a very nice lady. I will make a donation as I feel badly I missed the services. I was reading at the Journal and saw the notice. My dear Aunt Mary… I’m sure Uncle Pete and all your sisters, brothers and loved ones were waiting for you at the pearly gates with open arms. You were a very special person. I saw you last week, and even in your fragile state, you were still smiling. Thank you for the many memories that I will always hold dear. May you rest in eternal peace. Awesome picture of Mrs.mcCauley! Just as I remther with that big smile and always generous with her contagious laugh! Rest In Peace! I am very sorry for the loss of mary, I fondly remember her at Cerratani’s working in the deli section. she always had a smile on her face. She was a very nice lady. prayers to the family .